The end and object of conquest is to avoid doing the same thing as the conquered. Truly, if I were not Alexander, I would be Diogenes. 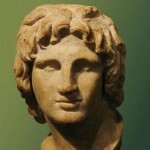 Alexander was born on the 6th day of the ancient Greek month of Hekatombaion, which probably corresponds to 20 July 356 BC, although the exact date is not known, in Pella, the capital of the Ancient Greek Kingdom of Macedon. He was the son of the king of Macedon, Philip II, and his fourth wife, Olympias, the daughter of Neoptolemus I, king of Epirus. Although Philip had seven or eight wives, Olympias was his principal wife for some time, likely a result of giving birth to Alexander. When Alexander was 13, Philip began to search for a tutor, and considered such academics as Isocrates and Speusippus, the latter offering to resign to take up the post. In the end, Philip chose Aristotle and provided the Temple of the Nymphs at Mieza as a classroom. Aristotle taught Alexander and his companions about medicine, philosophy, morals, religion, logic, and art. 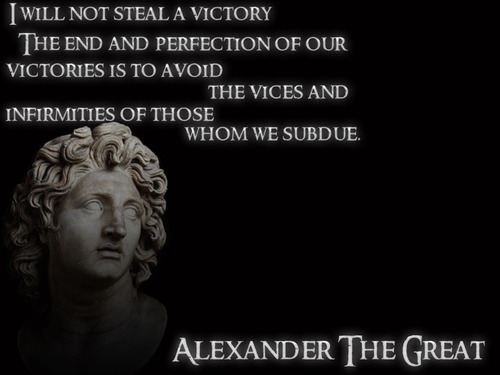 Under Aristotle's tutelage, Alexander developed a passion for the works of Homer, and in particular the Iliad; Aristotle gave him an annotated copy, which Alexander later carried on his campaigns. On either 10 or 11 June 323 BC, Alexander died in the palace of Nebuchadnezzar II, in Babylon, at age 32. Details of the death differ slightly – Plutarch's account is that roughly 14 days before his death, Alexander entertained admiral Nearchus, and spent the night and next day drinking with Medius of Larissa.